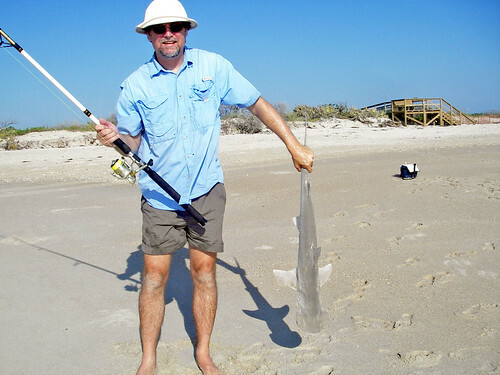 I landed another nice bonnethead shark this morning out at playa linda beach. (Here’s the video of catching a shark last summer.) The weather was gorgeous, no bugs, gentle breeze. Real easy fishing. The playa linda beach has restored itself nicely from the depletion in the 2004 hurricanes. So much sand was washed away that season that I recall the water was lapping at the dune lines at high tide. This picture here was just shy of the morning high tide.The shark put up a great fight, and was released unharmed. On the way back, I stopped at the newly renovated Lake Loughman lodge on the St. Johns. river system. The water level is so low, the lodge is about to close down. I watched this guy trying to get his 3.5 ton truck out of the bog. He tried to winch himself out, but only succeeded in pulling the truck deeper into the bank. A tow truck driver arrived, and he did the exact same thing, and pulled the stuck truck even deeper. Then the tow driver drove around behind and tried to pull the stuck truck the other way, but he got himself stuck. When I left, they were sitting in the shade waiting for a bigger truck. I’m taking a bit of a risk here by not setting a reserve price. 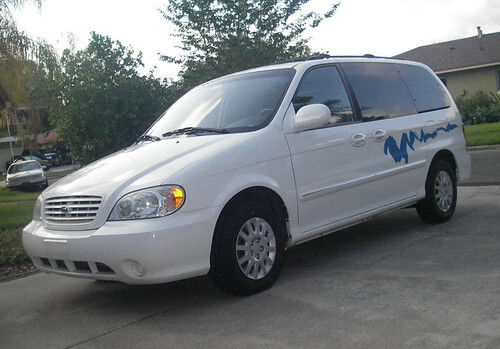 Most of the Kia Sedona’s sold on ebay have been the more upscale EX model. Mine is an LX, but I’m pretty confident I’ll get more than I could by trading it in. Anything more than $6K will be a win. Kelley blue book value for trade is $4900, and I’ve got some bumper damage. Auction ends late next saturday night. 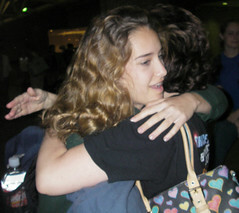 We saw Gina off this morning at 5am, flying direct to L.A. with 22 other youth and 14 adults for a weeks mission work in Mexico. Update: The group is called The Blanks, and they have a CD out. You can hear them on Acapodcast #9 singing a full length version of the Scrubs theme song “Superman”. It starts at about the 13 minute point on the 28 minute podcast. Here’s a realaudio stream of a complete cut from their album called “A Little Polish”. Did you see this segment on the NBC show “Scrubs” a few weeks back? Hospital business manager Ted has an a cappella quartet, and they take on a classic. I could so see this as Makeshift schtick. Today is Gina’s last day of middle school. This photo was snapped by one of her friends during her recent 8th grade field trip to Universal Studios. We were approached through our church network about possibly hosting a Lebanese teenage exchange student for the next school year. The program is coordinated by AYUSA. Gina was immediately enthusiastic and thats enough for me to get on board. This will be a bit more involved than our brief visit by Japanese student Marina this spring. The student will enroll and complete a year at Winter Park High. We’re being interviewed in a home visit by a AYUSA rep this week.